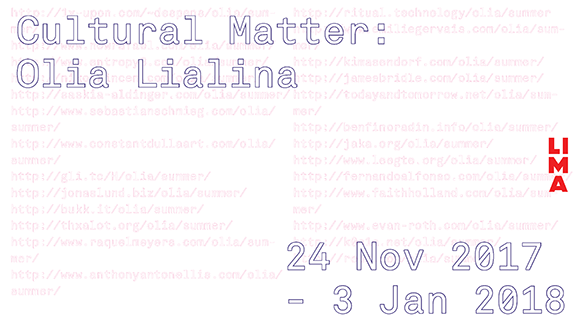 Olia Lialina’s online browser-based artwork Summer (2013) is the work in focus for the second exhibition of LIMA’s Cultural Matter programme. In this animated piece by Lialina, we see the artist swinging back and forth, infinitely looped, basking in bright sunlight. Cut out against a gradient background of blue and white, the swing is hung from the location bar of the browser. The animation’s 18 still images are located on 26 different websites, with each site redirecting the browser from one server to the next, displaying the images in sequence, thus creating a cross-domain animation. The work is literally scattered across the internet, making it impossible to watch offline. The speed and rhythm of the image sequence, the animation itself, depends on the internet infrastructure that supports it. Just one connection or web page down will result in breaking the work. Summer showcases the degree to which art and computer networks can be, and are, intertwined. At LIMA, this leading artwork will see itself in a new site specific presentation that will be enriched with documentation material. During the exhibition two public events will take place to shed light on both the art historical and material implications of the work. In talks, presentations and screenings, the past and future of the work will be discussed and unfolded. Participating artists: Nicholas O’Brien, Harm van den Dorpel, Constant Dullaart, Olia Lialina, UBERMORGEN.Curated by: Sanneke Huisman and Jan Robert Leegte.